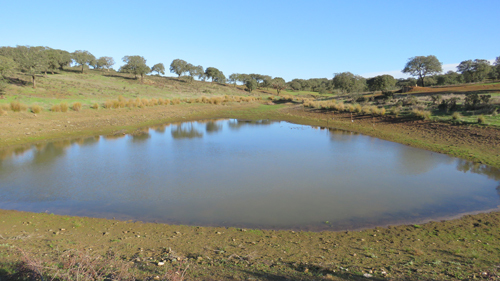 After being completely dry since September, Windmill Pond at last shows signs of filling up after some rainfall in November to 6th January 2018. 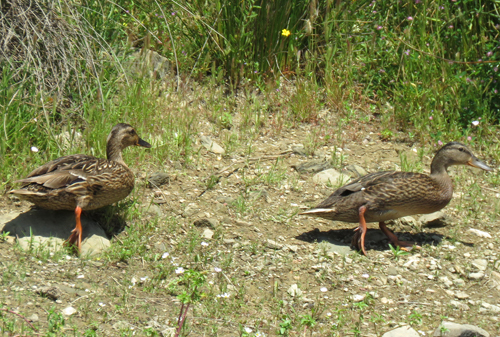 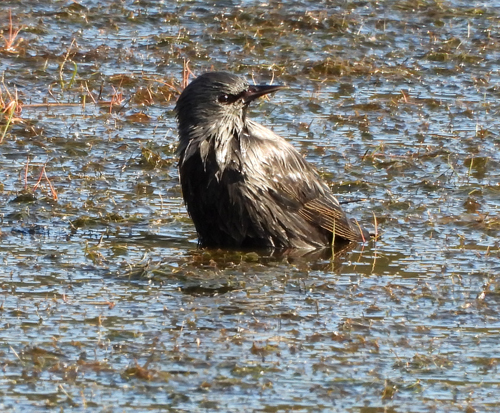 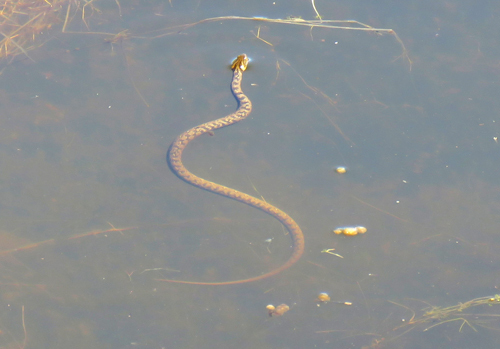 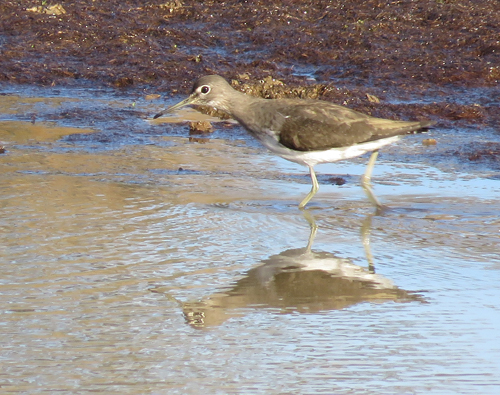 The newly part-filled pond attracted the first new bird species of the year. 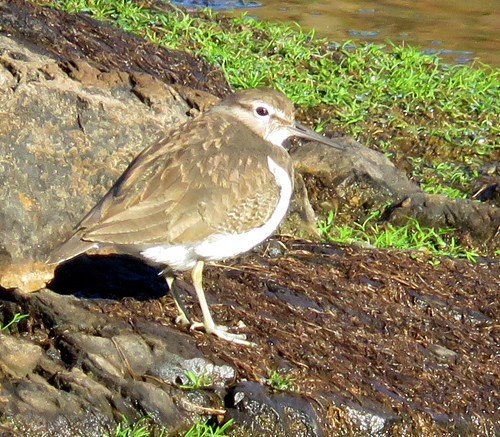 A Common Sandpiper - a Winter Migrant. 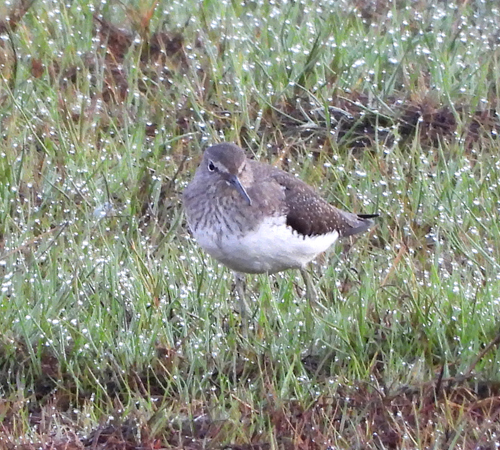 And this Green Sandpiper, another Winter Visitor. 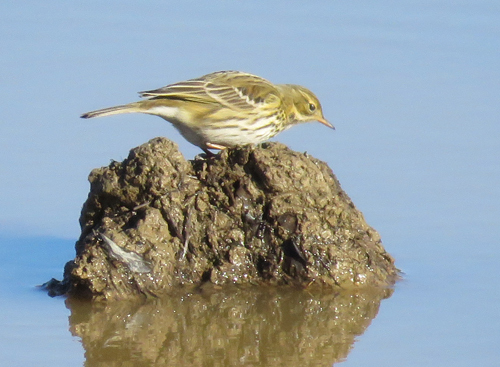 Meadow Pipits also feed at Windmill Pond in January. 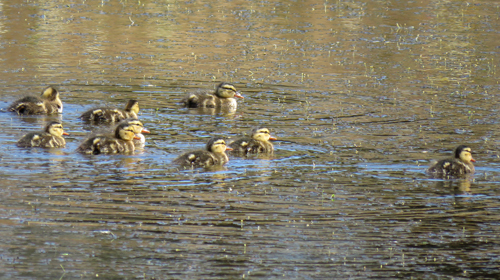 They are also Winter and Passage Migrants. 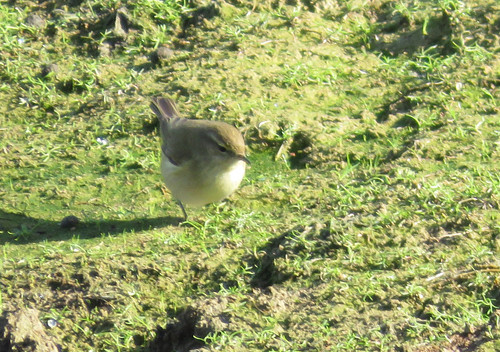 Other migrants that feed around Windmill Pond include small groups of Common Chiffchaffs. 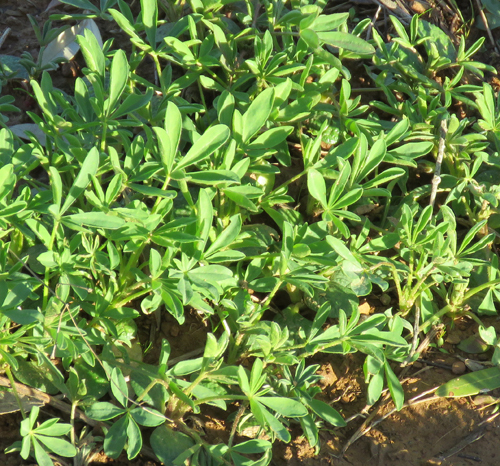 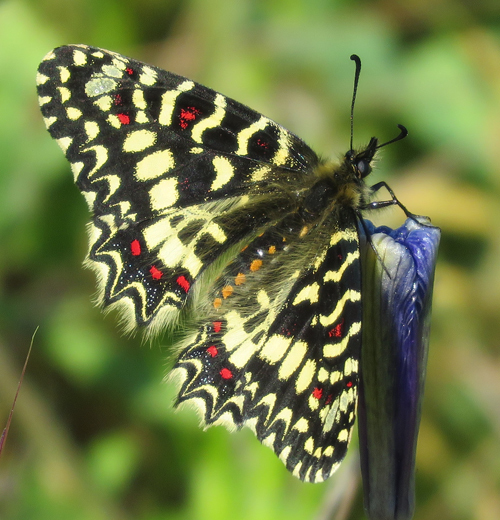 Yellow Lupin plants are sprouting in the Olive Grove where they have been sown as a green manure. 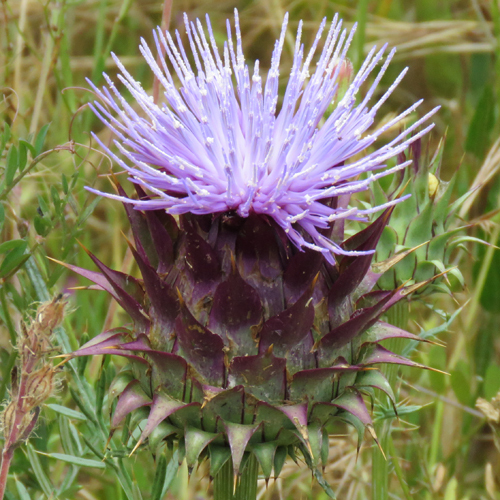 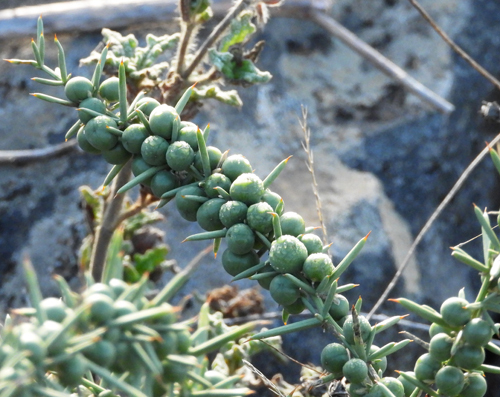 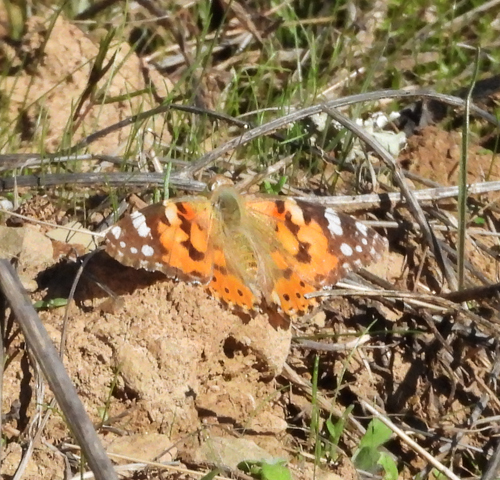 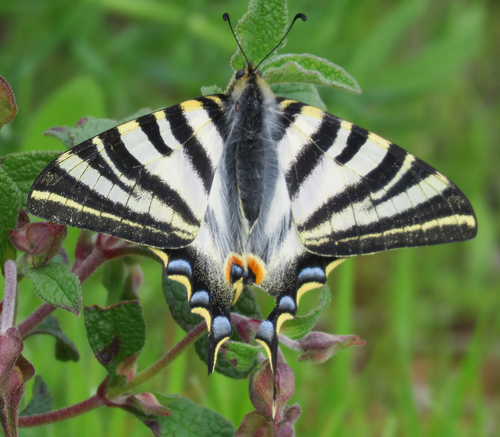 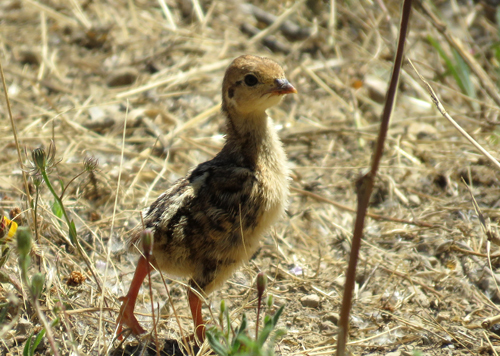 They are a species native to Portugal. 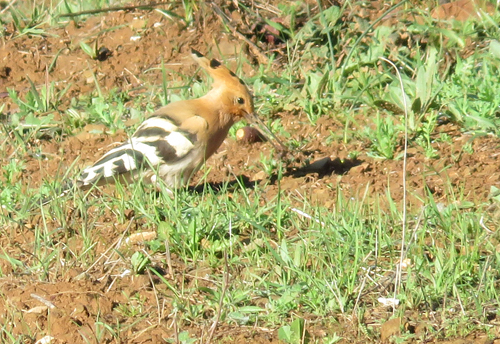 Resident Eurasian Hoopoe feeding among the first flush of new plant growth following the late Autumn/early Winter rains. 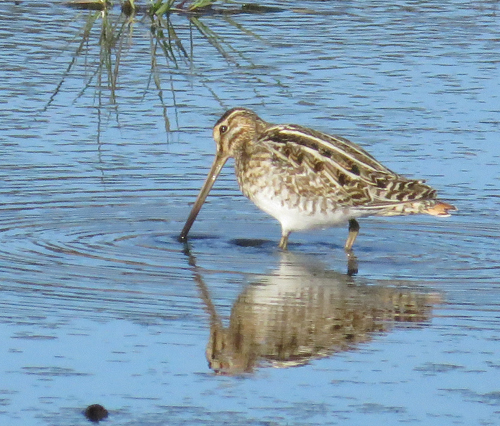 Passage migrant stops for a few days to refuel - a Common Snipe. 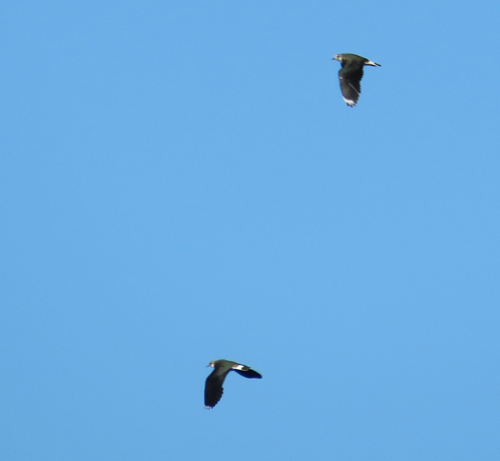 A couple of Northern Lapwings seen flying over Windmill Pond were the first record for this species on the reserve. 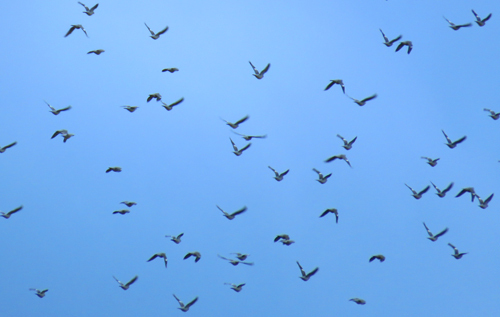 In Winter large flocks of Common Woodpigeons gather on the reserve's open woodland (Montado) to feed on the abundant Sweet Oak acorns. 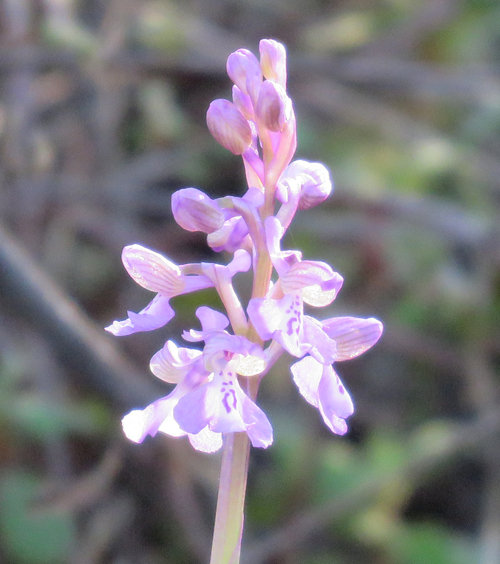 One of the few flowers out in February is the Dusky Dogfennel. 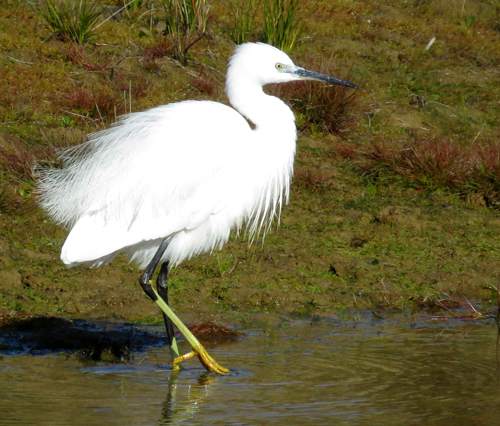 Little Egret at Windmill Pond already has its breeding plumage on show. 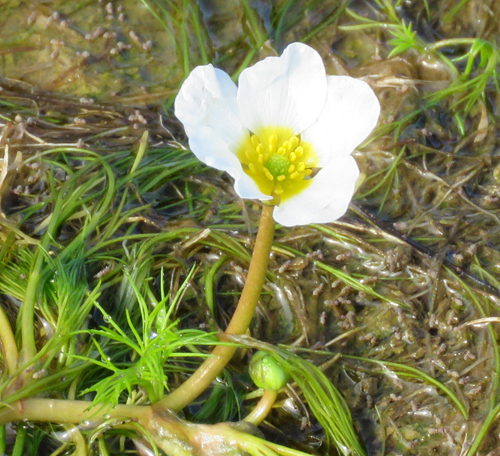 This aquatic plant, Stream Water-Crowfoot, starts flowering in February. 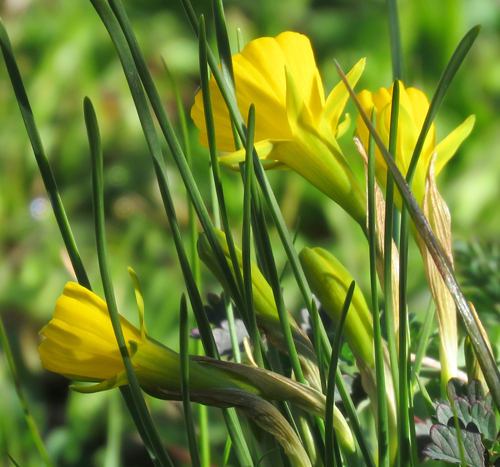 Hoop Petticoat Narcissus, another early flowering plant. 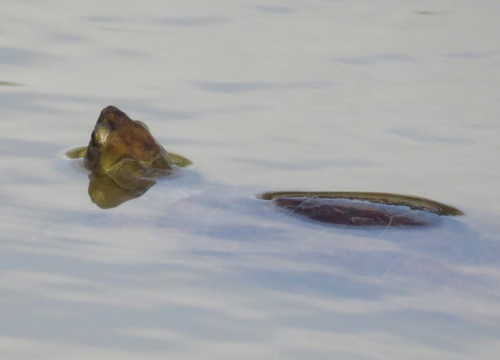 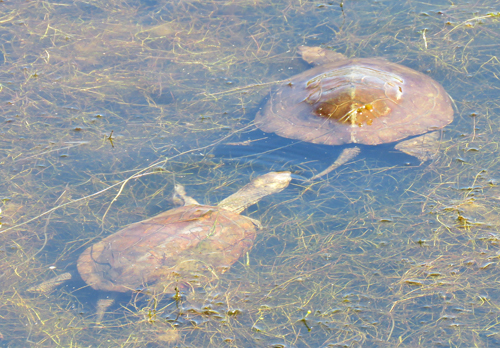 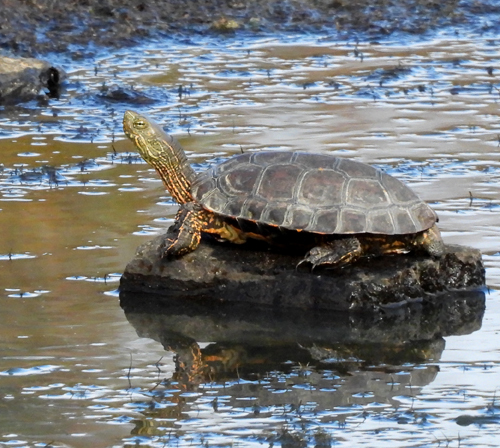 First Iberian Pond Turtle (sometimes called Spanish Terrapin) of the year - 4th March. 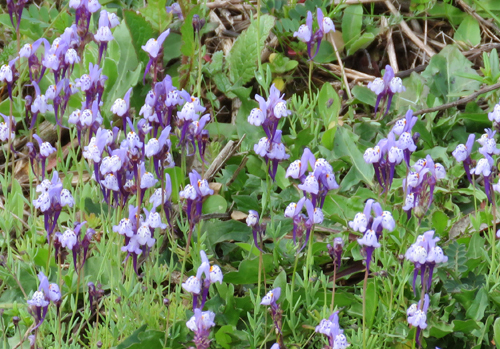 Stunning display of Annual Toadflax. 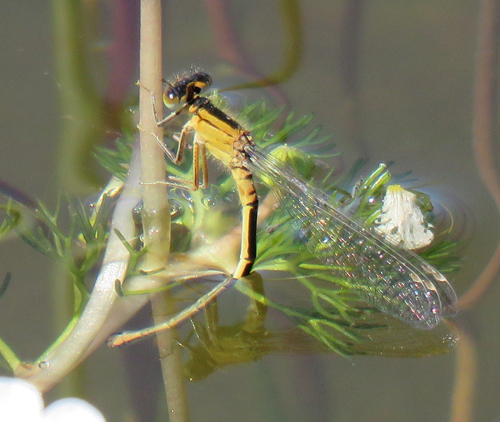 After 73mm rain in five days all the Stream Water-Crowfoot flowers are now under water until they can grow back to the surface again. 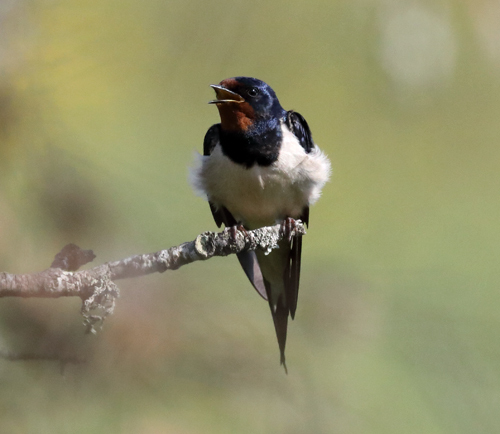 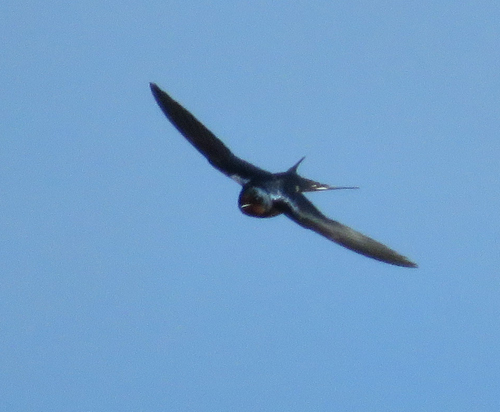 One of the firsts Barn Swallows of the year flying over Windmill Pond. 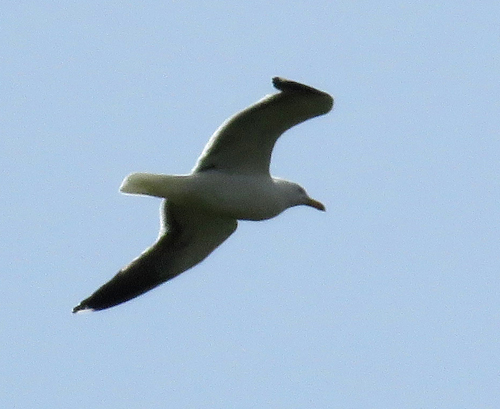 Yellowlegged Gull, an occasional visitor, seen flying over Windmill Pond during a short break in a thunderstorm. 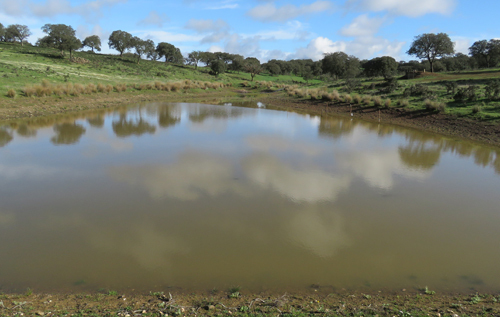 Windmill Pond is full again ! 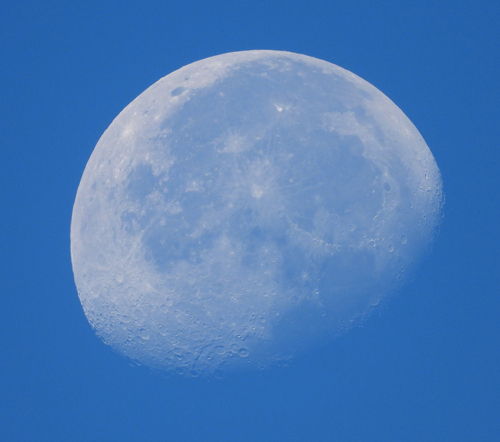 March 8th. 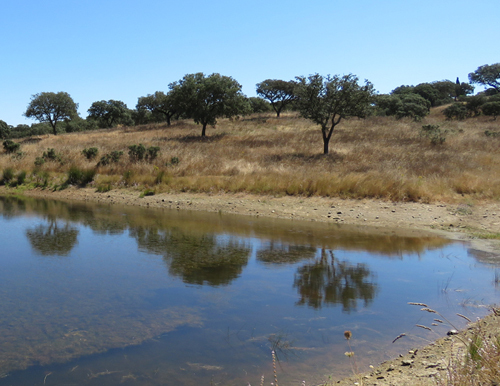 The pond is now at its maximum depth and is overflowing into the downstream river. 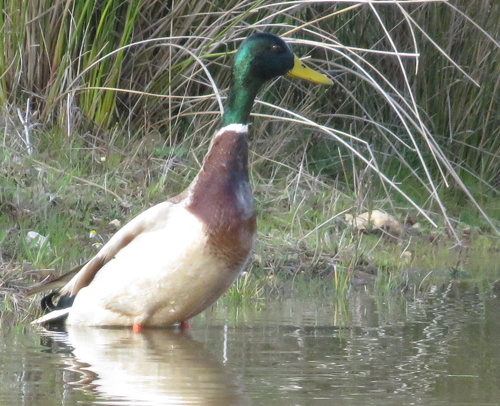 Now Windmill Pond is full some Mallards have returned. 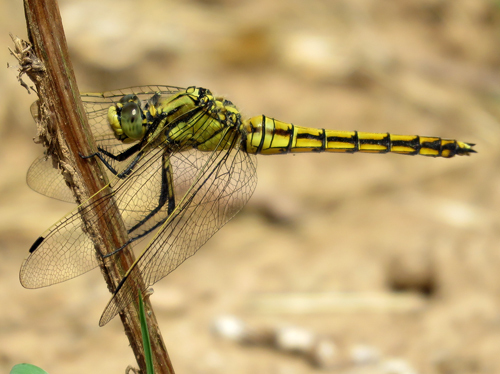 Here a male. 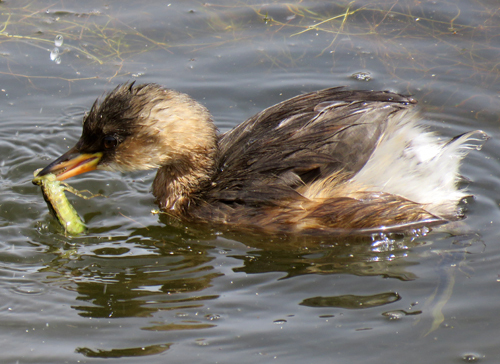 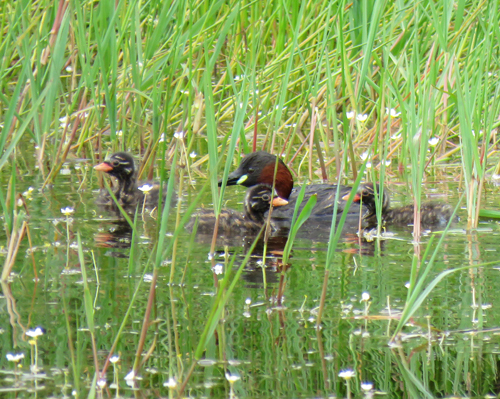 Little Grebes are also back in residence. 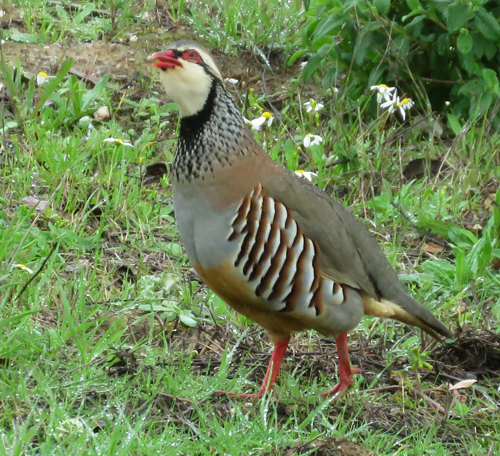 Redlegged Partridge making territorial call. 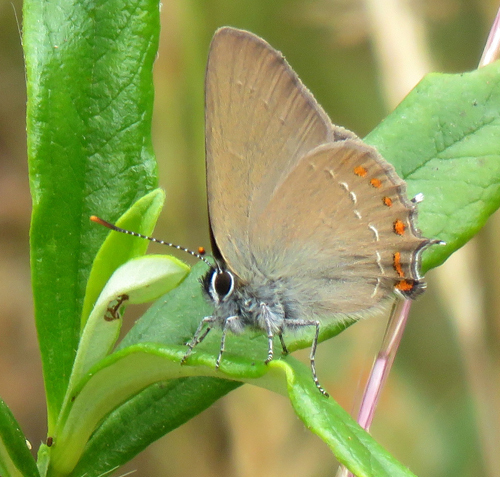 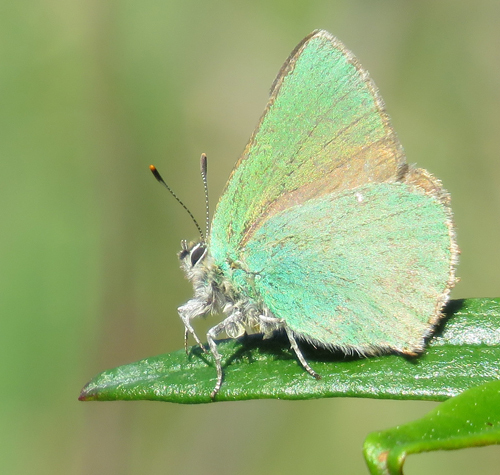 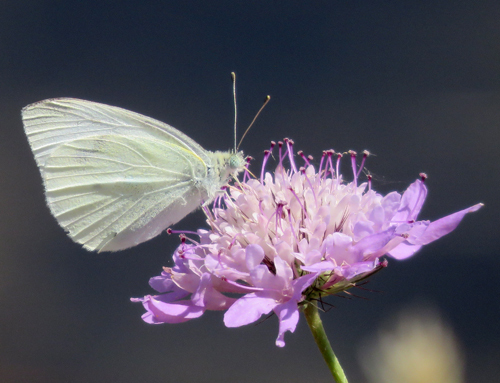 An early butterfly on the wing: A Green Hairstreak. 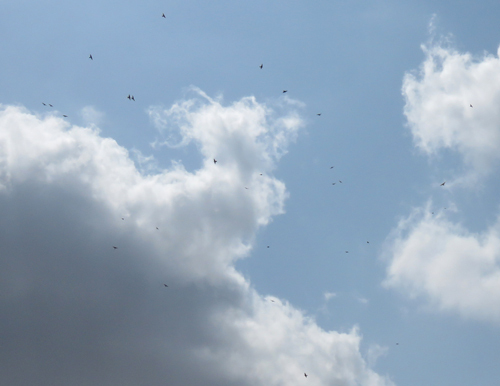 Bats are about. 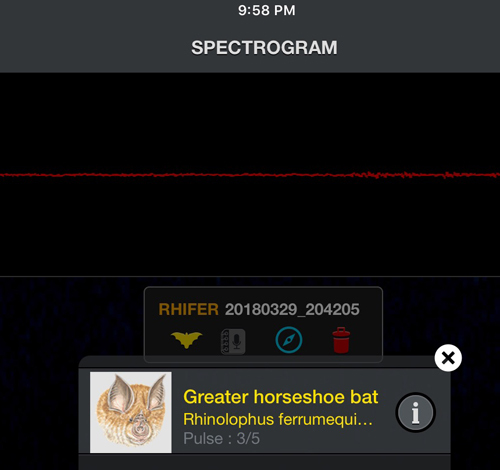 This Greater Horsehose Bat was recorded with an Echo Meter Touch 2 Bat Detector attached to an iPad as it hunted for insects over the Windmill Pond. 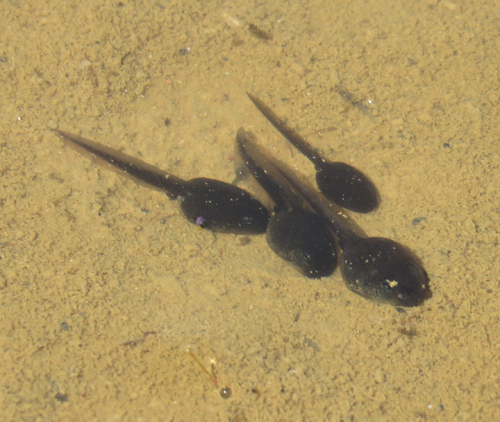 Tadpoles in shallow puddle in earth road. 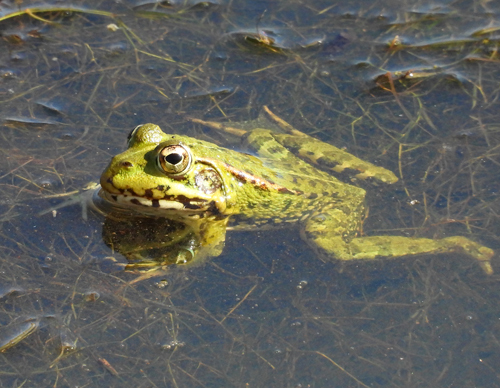 Probably Iberian Water Frog. 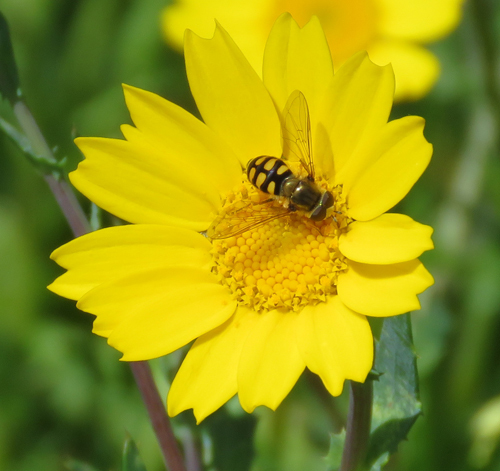 Hover Fly on Corn Marigold. 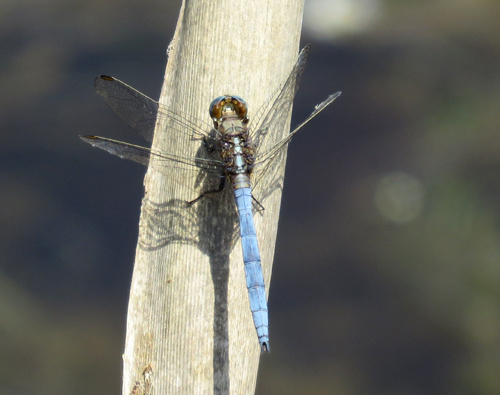 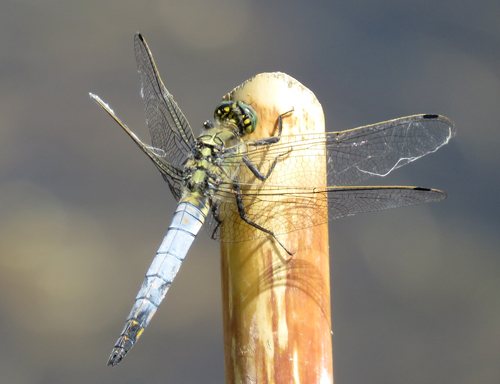 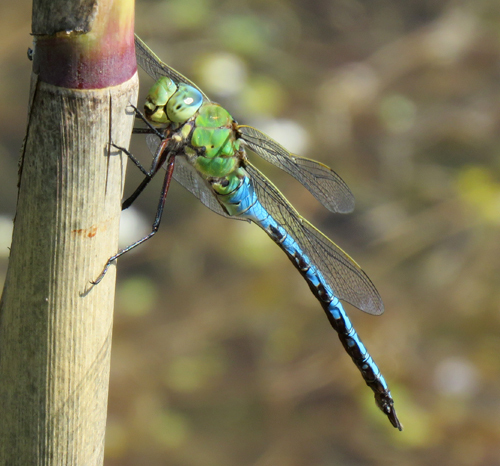 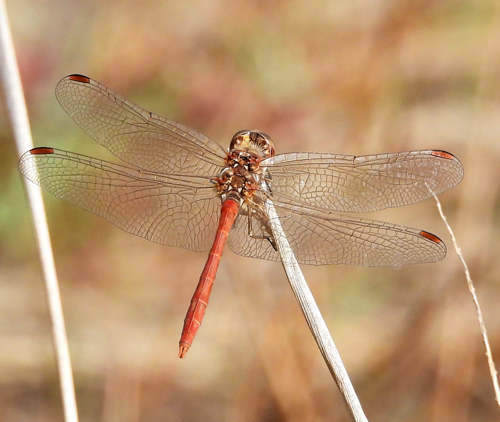 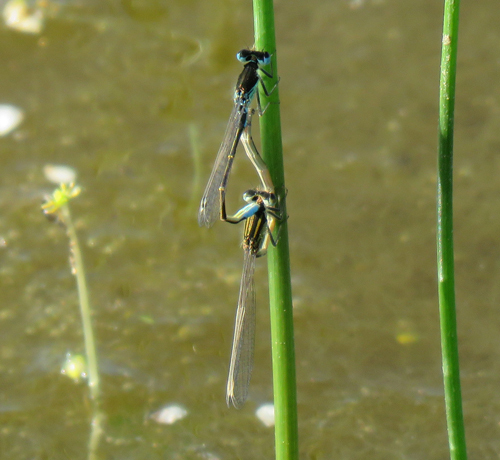 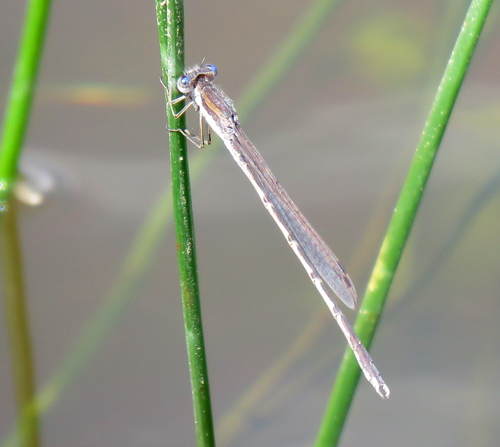 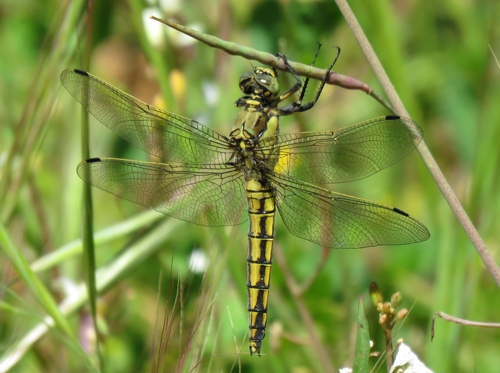 Common Winter Damsels are active throughout the year. 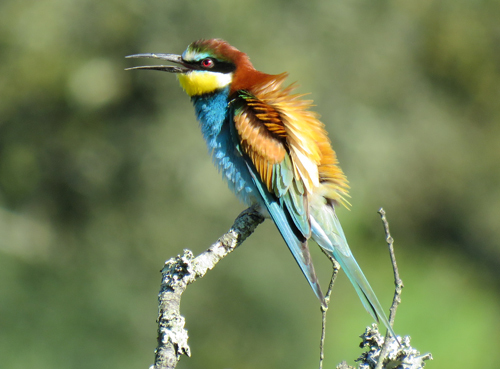 European Bee-eaters arrived back on 6th April. 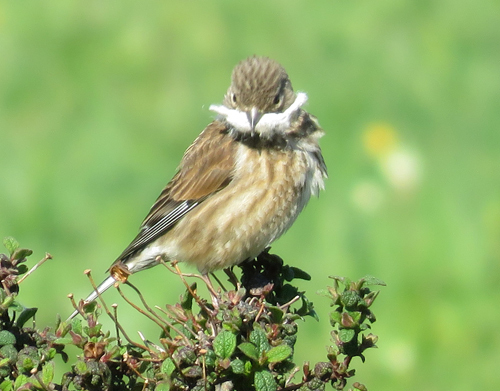 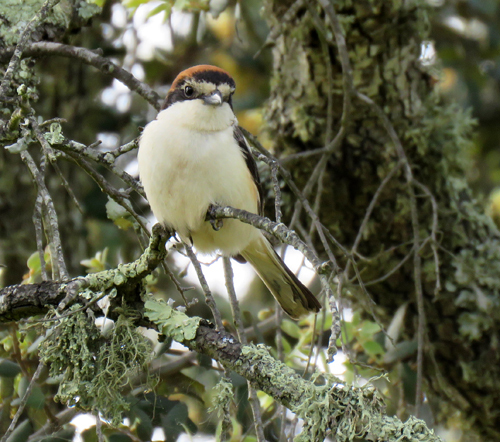 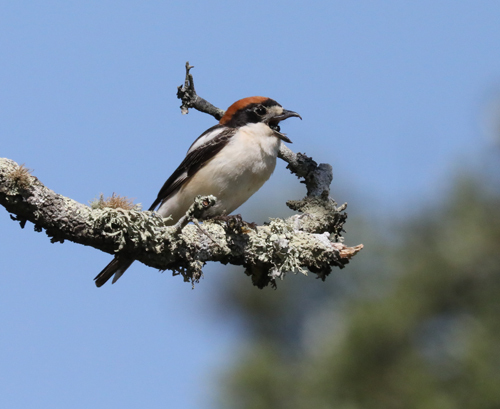 Woodchat Shrike coughing up pellet on undigested food items, presumably mostly insect carapaces. 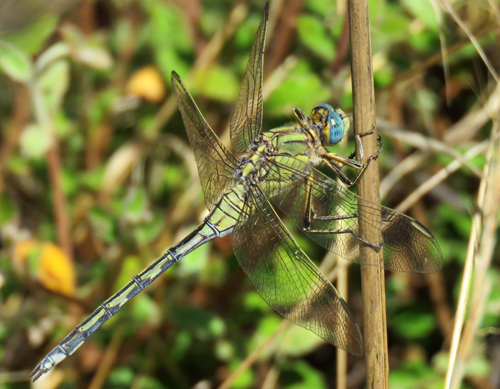 Female or teneral male Blacktailed Skimmer. 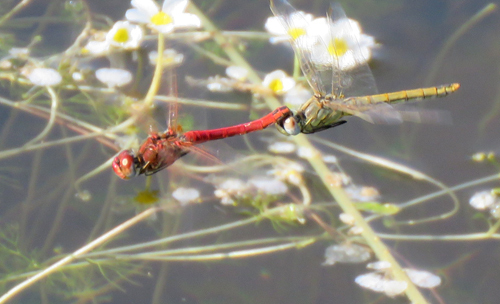 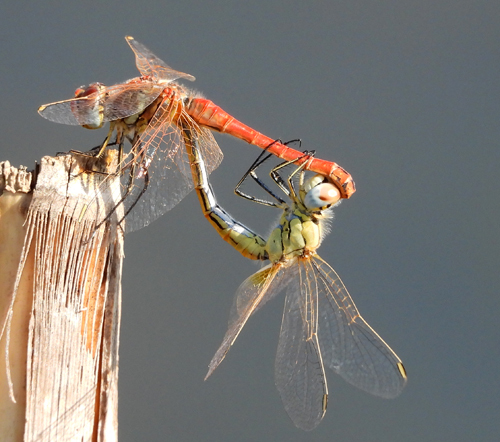 Redveined Darters mating while in flight over Windmill Pond. 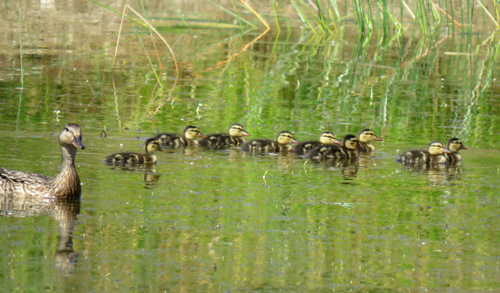 Photographed on the same day as the adult with chicks. 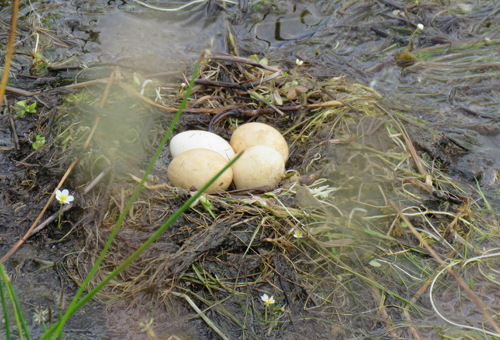 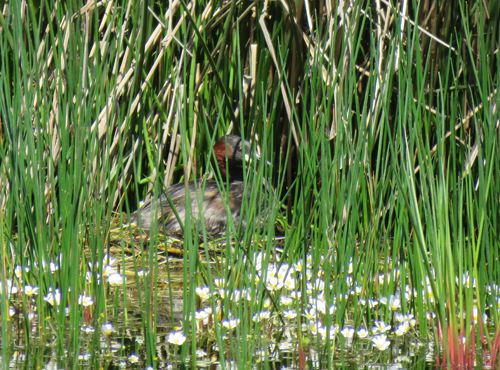 A new Little Grebe nest with four eggs. 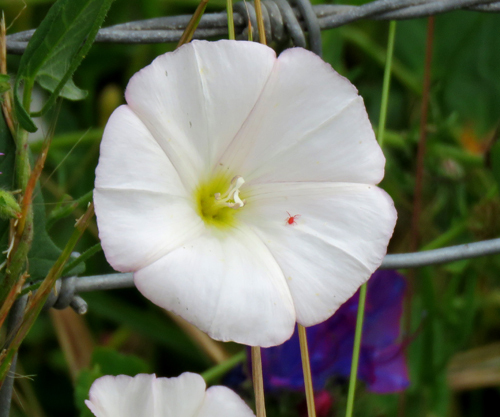 Field Bindweed with Red Velvet Mite. 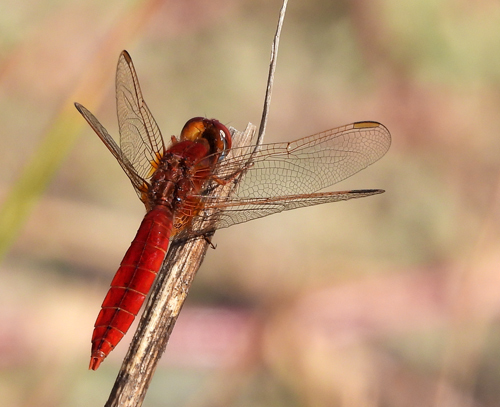 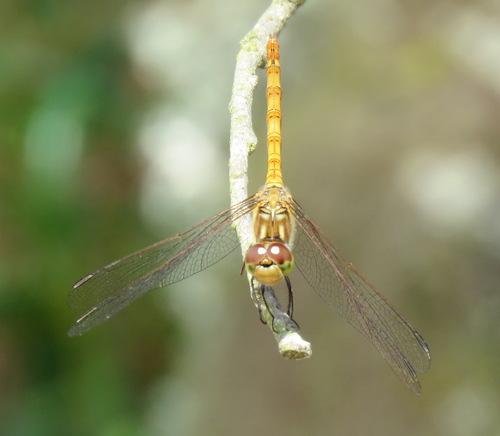 Female Ruddy Darter perched on branch of Sweet Oak. 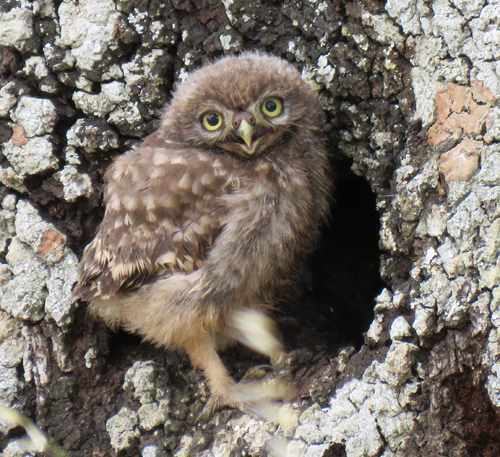 Fledgling Little Owl stood at entrance to nest hole in Sweet Oak, hissing quietly. 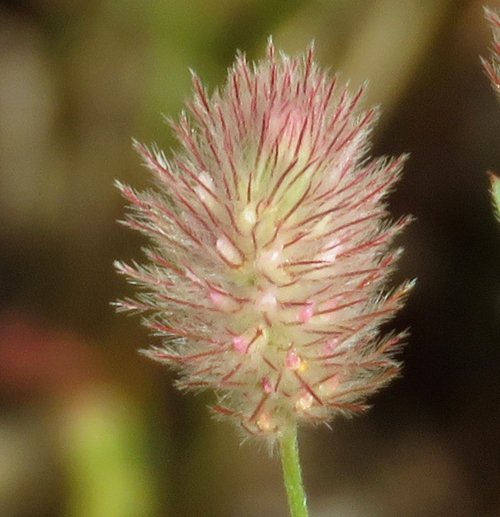 Reversed Clover. 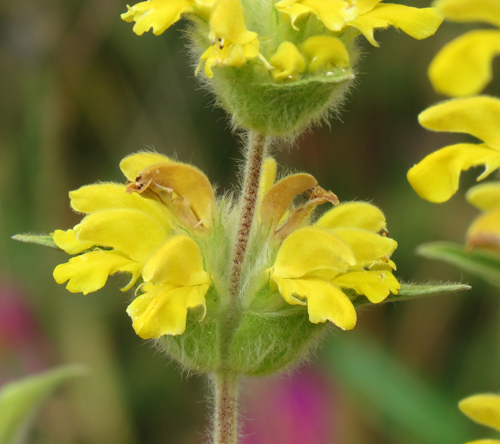 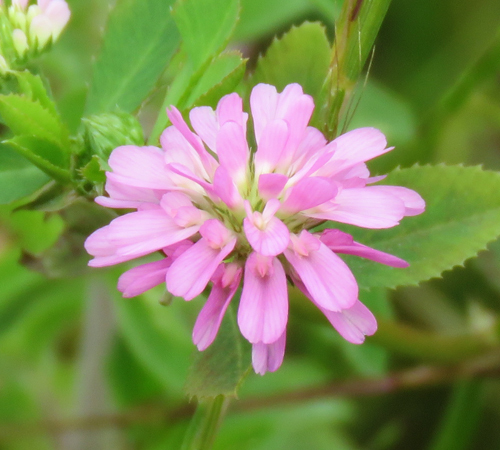 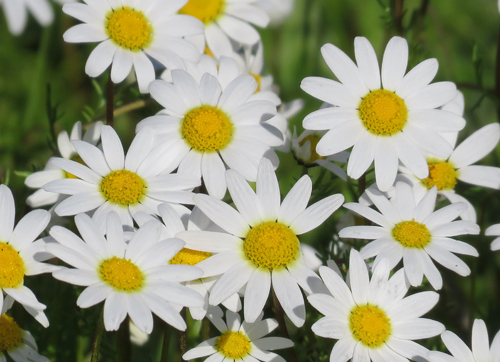 So named because the flowers are held 'upside down' compared to other clovers. 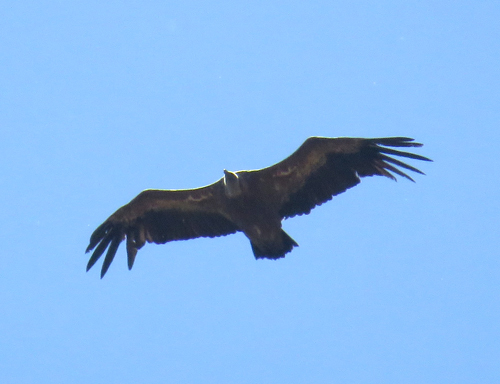 Griffon Vulture. 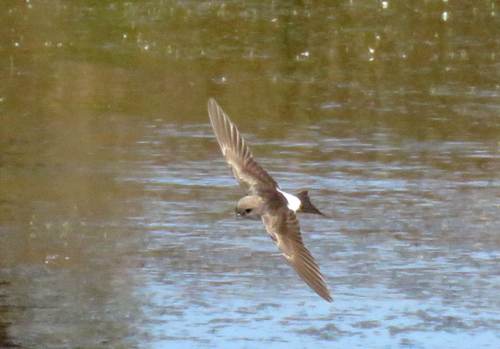 One of seven that flew over the reserve one morning. 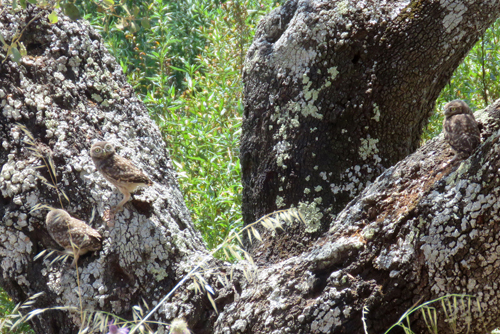 Three Little Owlets on Sweet Oak. 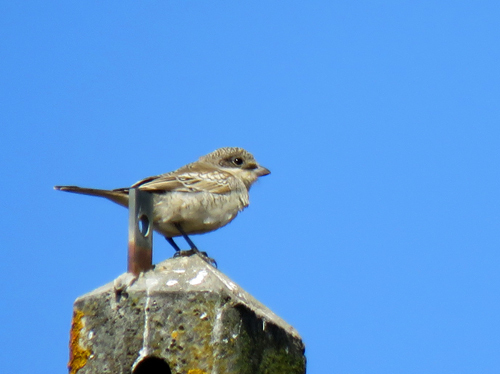 The owlet on the left is next to their nesting hole. 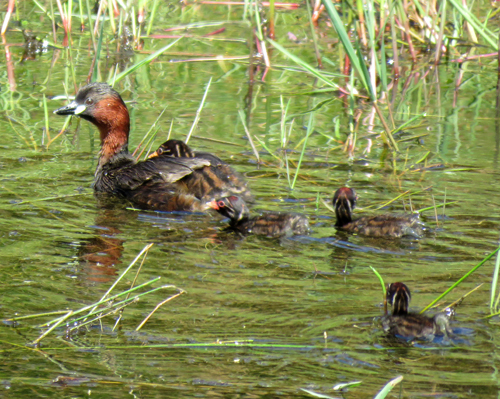 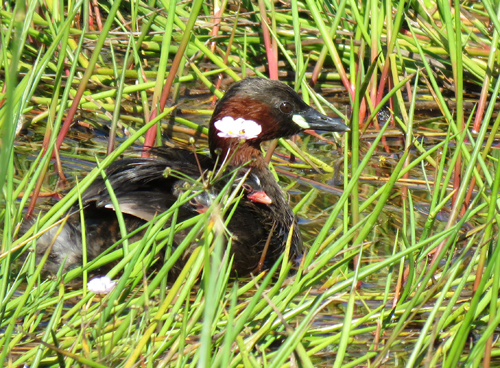 29th June: Little Grebe, probably a female,with (at least) 2 day or two day-old Chicks on her back. 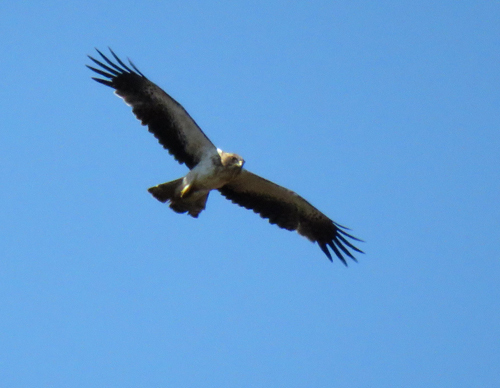 Booted Eagle - a Summer visitor. 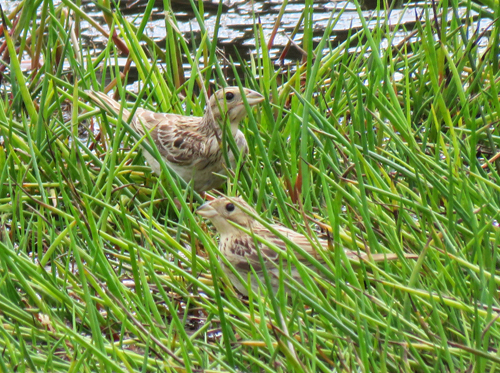 Juvenile Corn Buntings drinking at Windmill Pond. 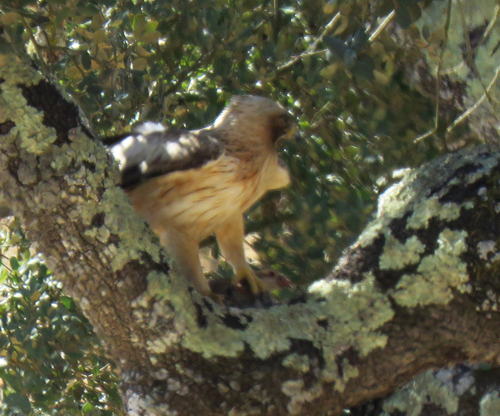 Booted Eagle, a Summer Visitor, with Redlegged Partridge prey in talons. 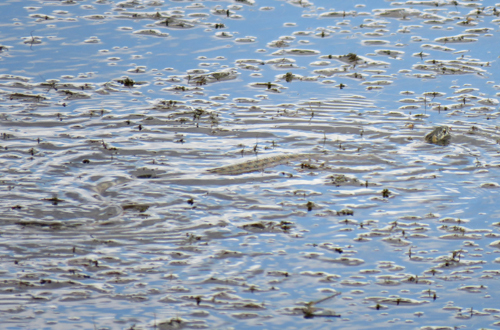 Windmill Pond 2018 08 28. 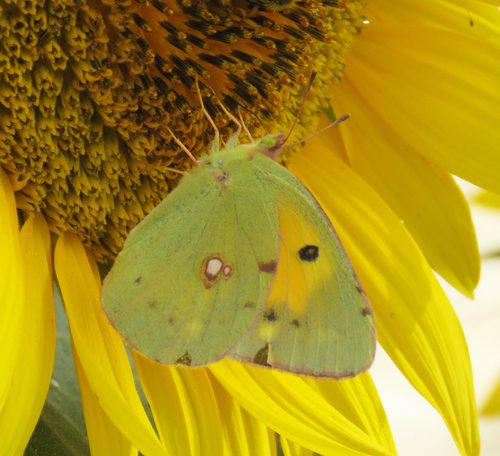 Clouded Yellow feeding on a garden Sunflower. 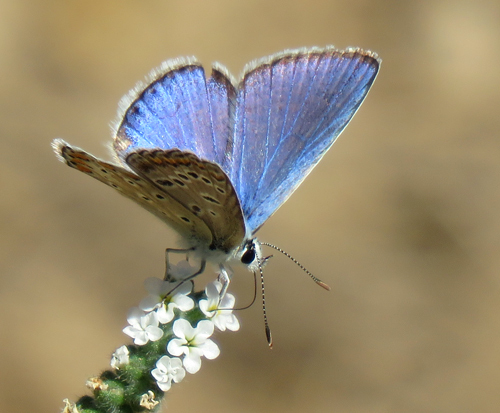 Male Common Blue feeding on nectar from Common Heliotrope flowers, one of the few plants that flowers in August. 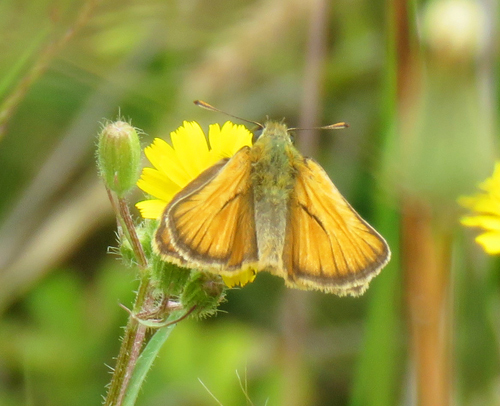 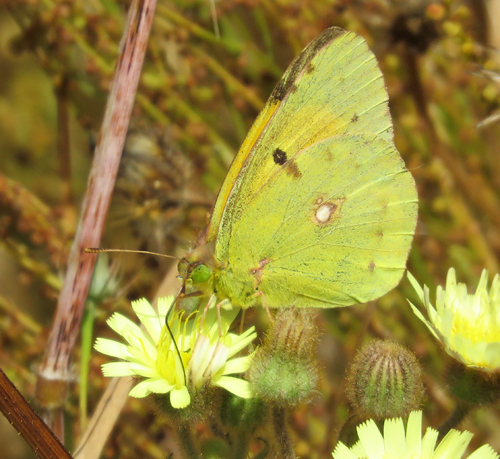 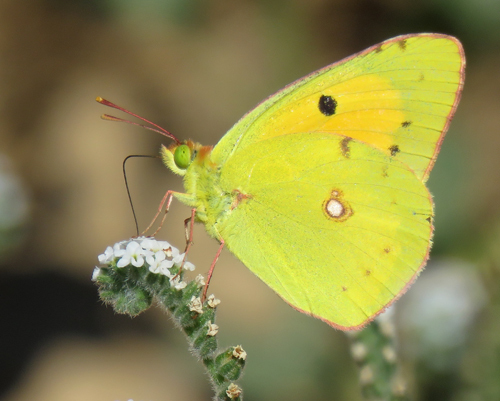 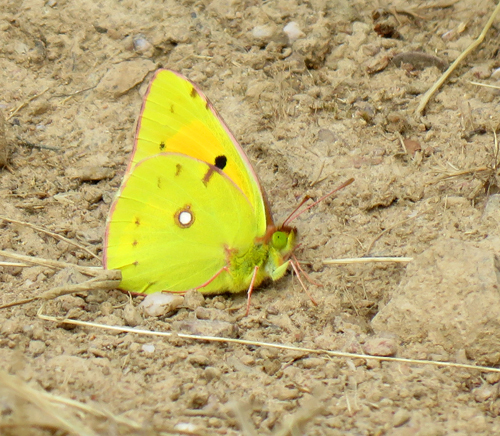 Clouded Yellow also feeding on Common Heliotrope. 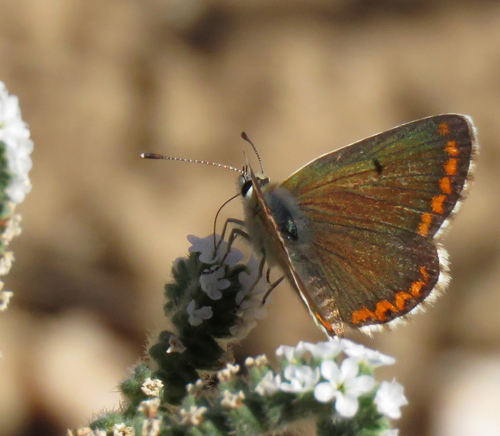 Male Southern Brown Argus also feeding on Common Heliotrope. 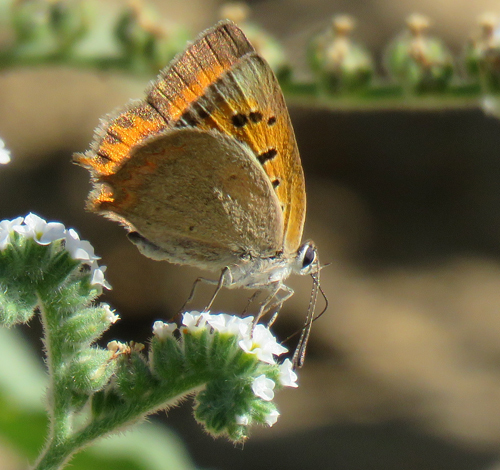 Small Copper also feeding on Common Heliotrope. 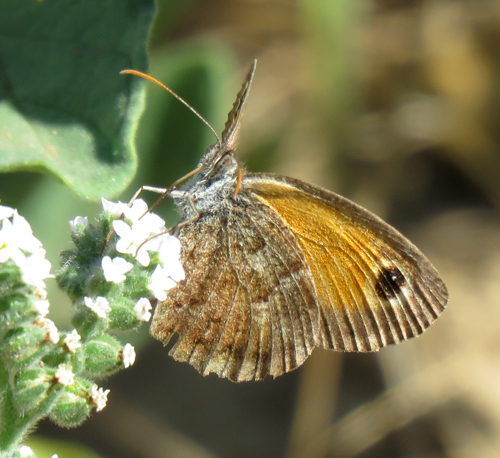 Southern Gatekeeper also feeding on Common Heliotrope. 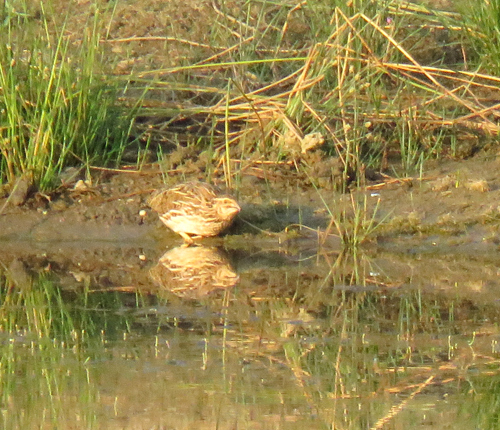 Common Quail drinking at Windmill Pond. 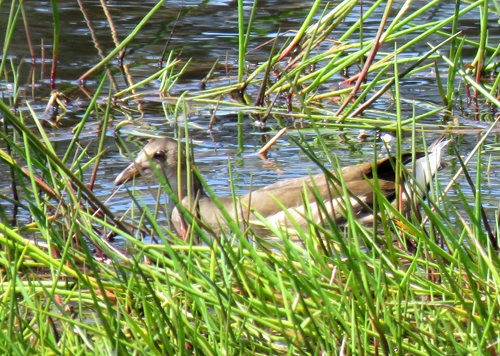 These birds are so difficult to see in an undisturbed state. 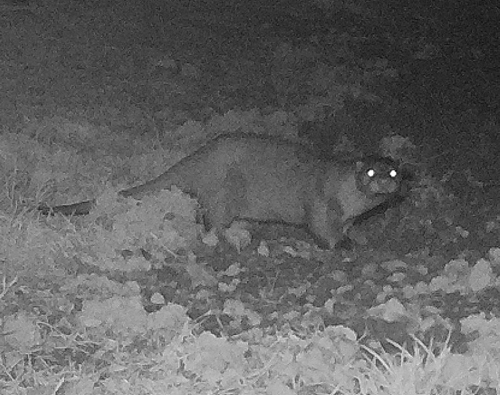 A wonderftul sighting indeed. 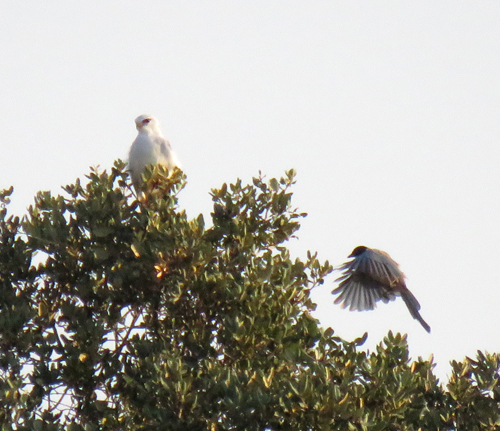 Blackshouldered Kite at top of Sweet Oak, being mobbed by Iberian Azurewinged Magpies. 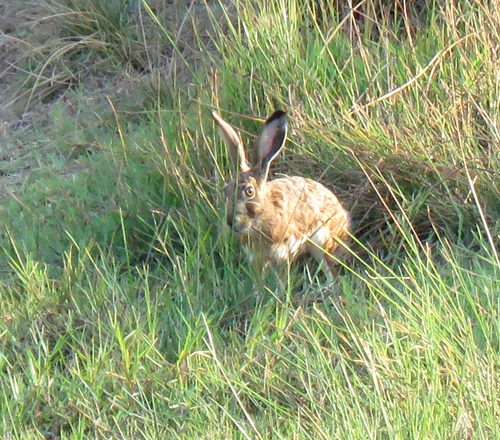 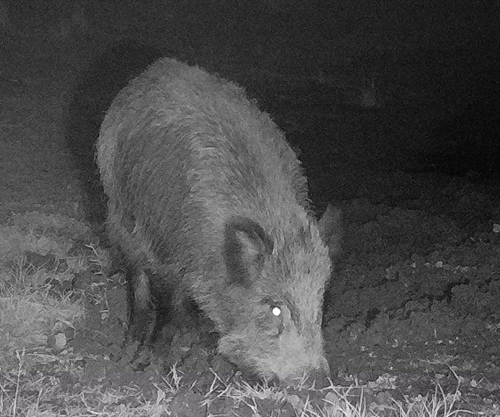 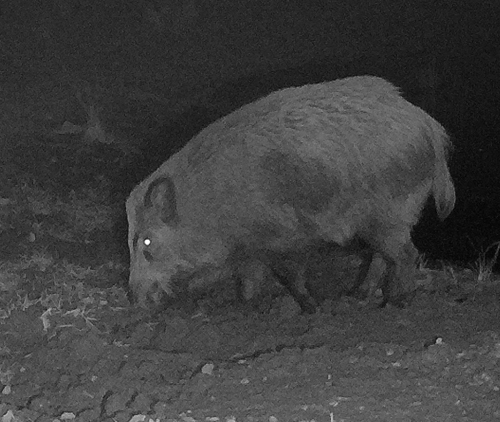 Iberian Hare visits the Spring to have a drink in the early morning. 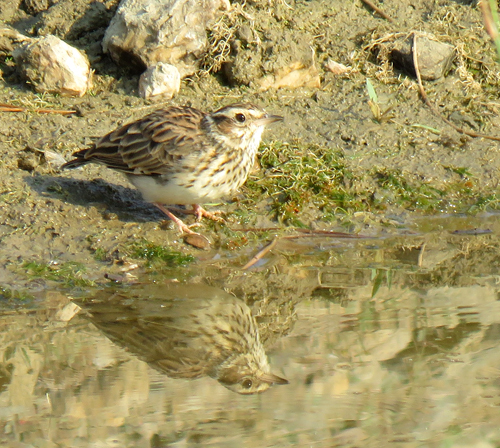 A Woodlark stops at Windmill Pond for a drink. 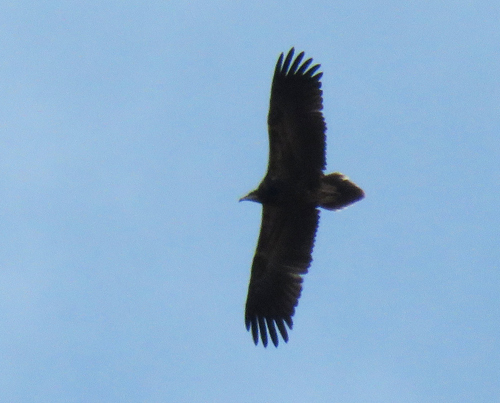 A Juvenile Egyptian Vulture - our first Endangered Species ! 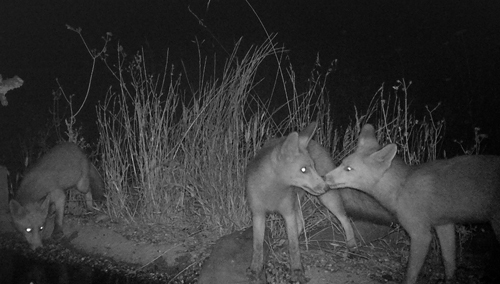 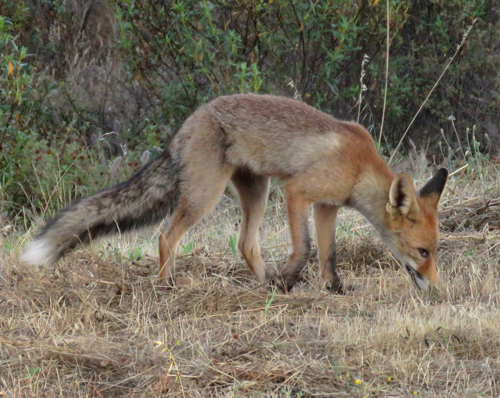 Iberian Fox at Windmill Pond. 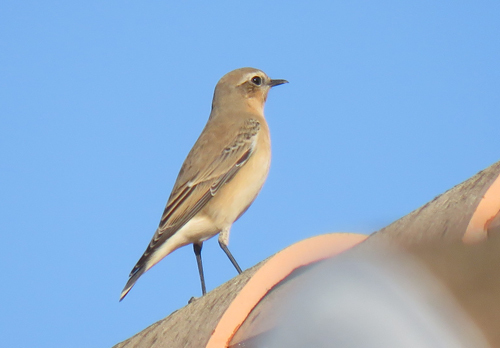 A Northern Wheatear, an Autumn migrant, arrives at the reserve. 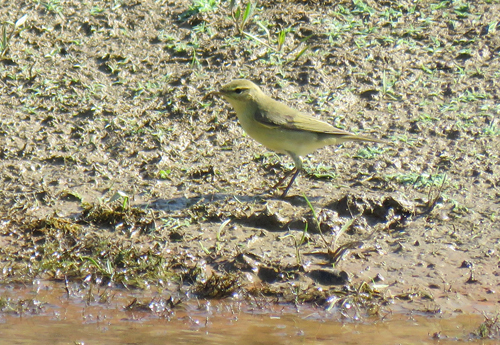 Another Autumn migrant, a Willow Warbler at the edge of Windmill Pond. 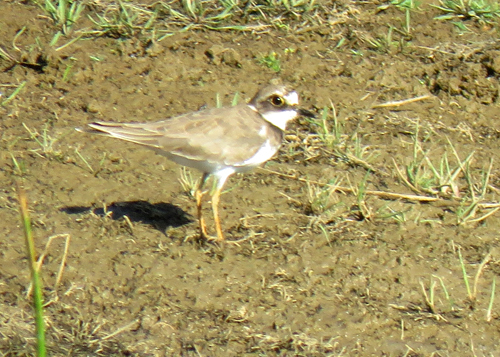 Another Autumn migrant, a Little Ringed Plover at the edge of Windmill Pond. 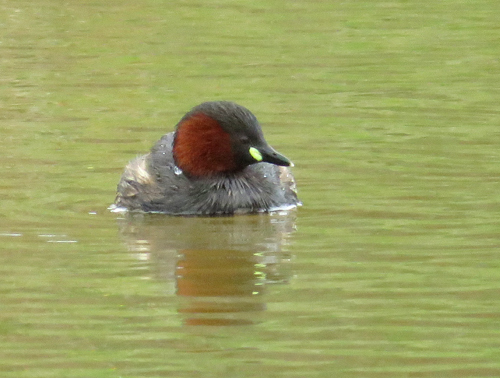 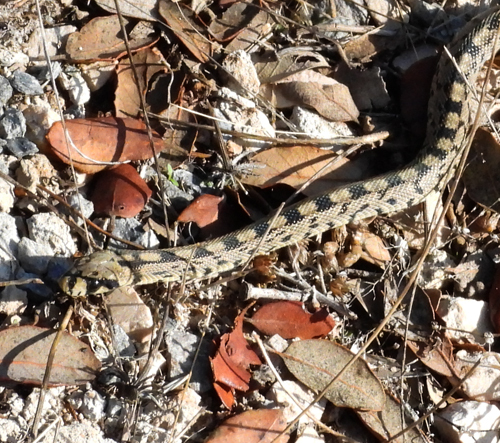 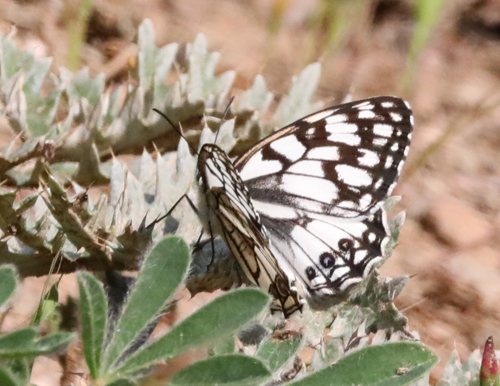 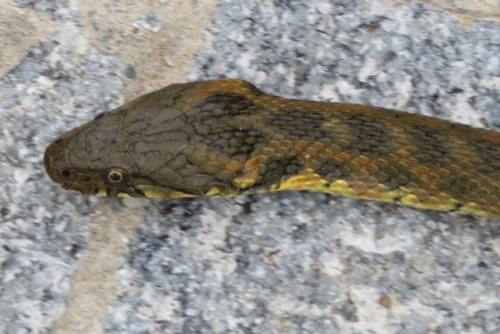 Note the diagnostic yellow eye-ring. 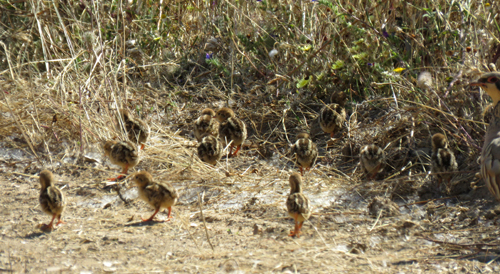 Eurasian Hoopoes are common residents on the reserve. 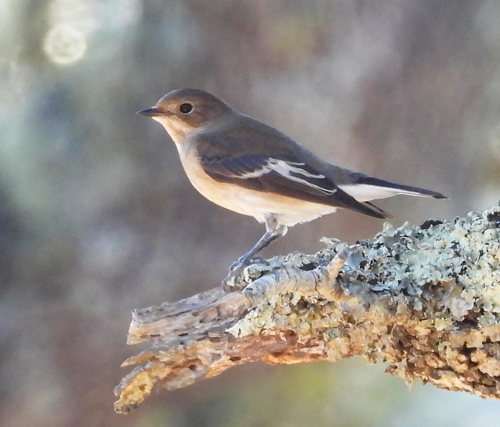 Female or Immature Pied Flycatcher perched in shady Sweet Oak. 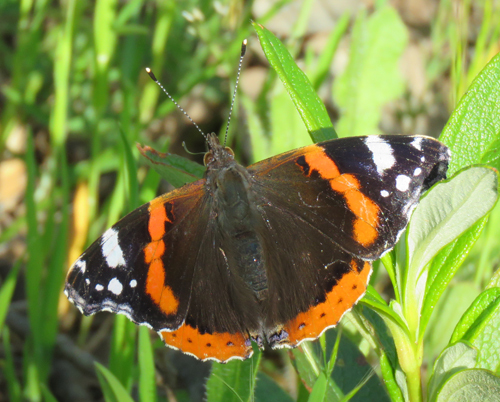 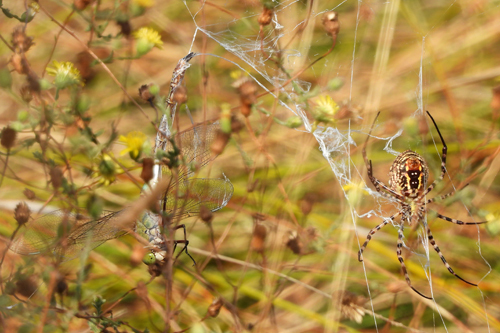 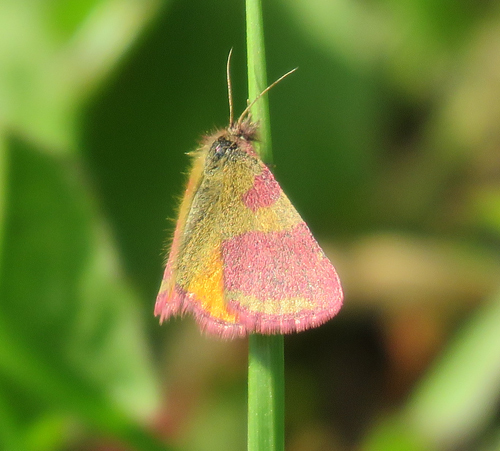 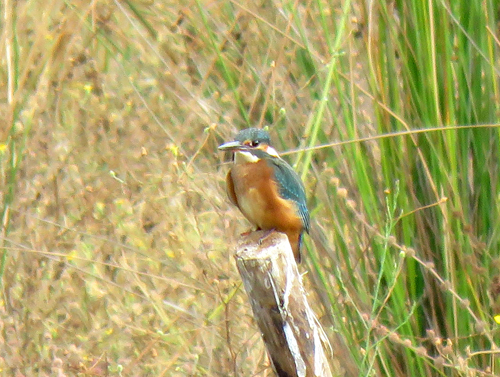 An Autumn/Winter visitor to the reserve. 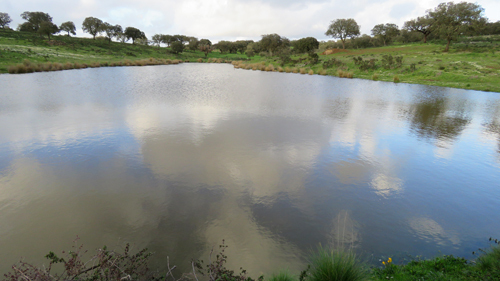 Windmill Pond as seen on 2018 09 29. 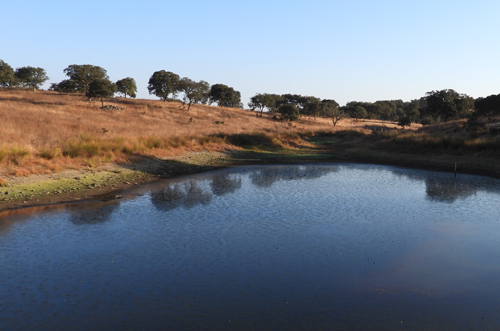 In 2017, on the same date, the pond was completely dried up. 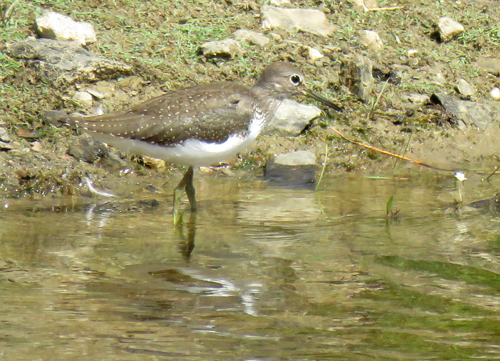 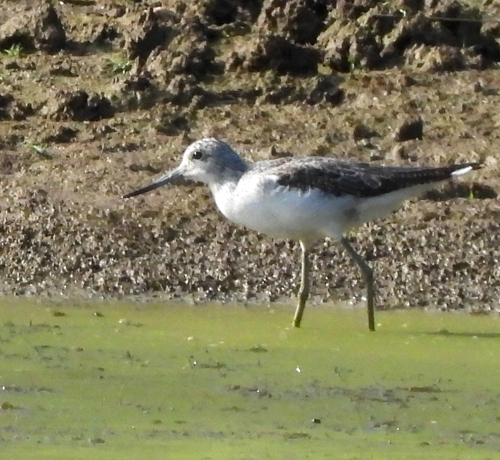 Green Sandpipers are still visiting Windmill Pond which still has water in it, unlike the same time last year. 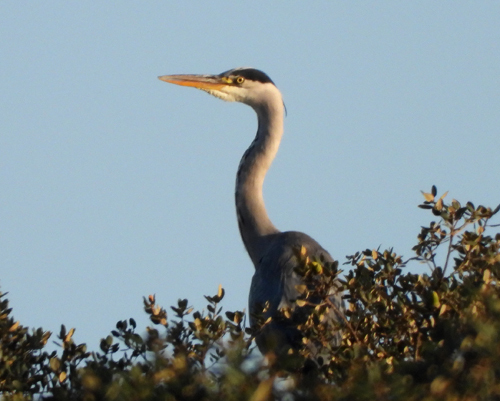 Adult Grey Heron in Sweet Oak overlooking Windmill Pond. 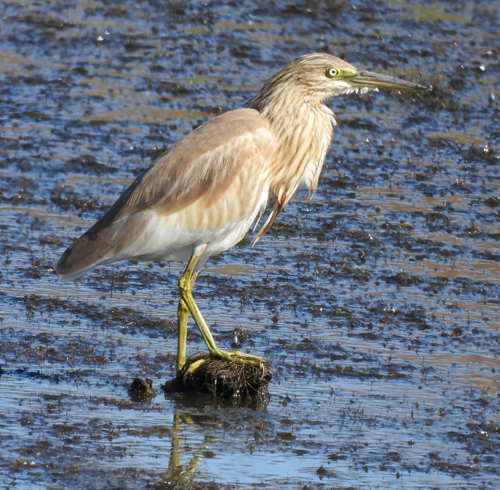 Very rare sight in inland Portugal, a Squacco Heron. 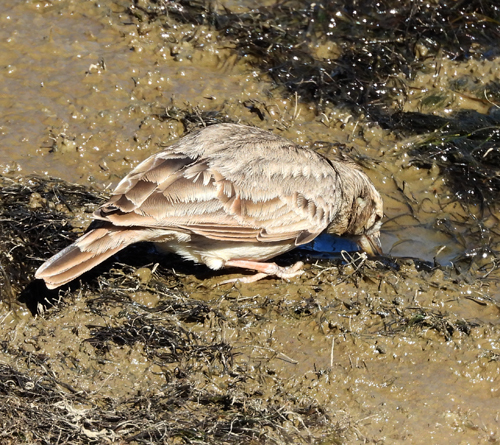 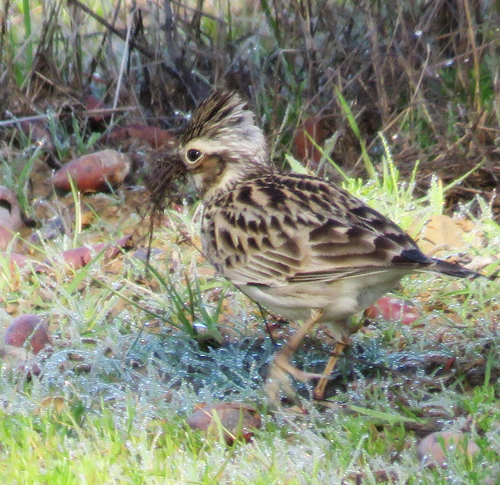 Crested Llark drinking at Windmill Pond. 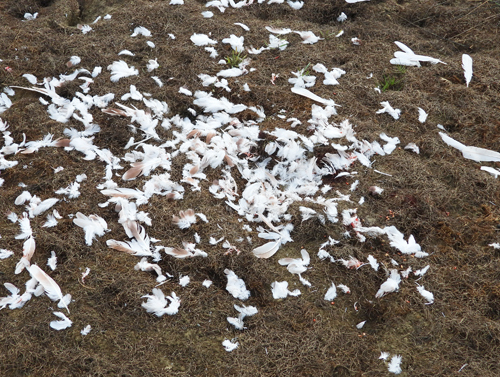 Remains of a Pigeon killed and eaten by a Peregrine Falcon at Windmill Pond. 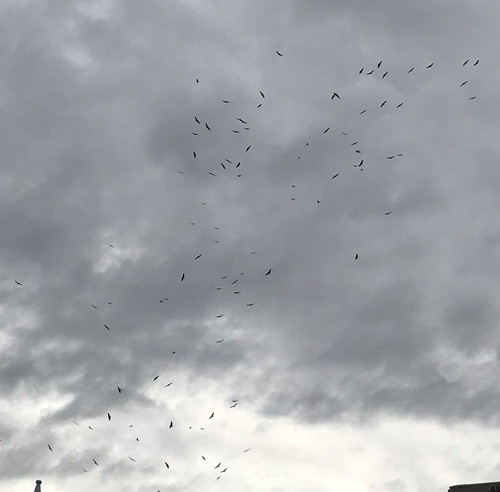 Part of group of 200 Griffon Vultures (20th October 2018). 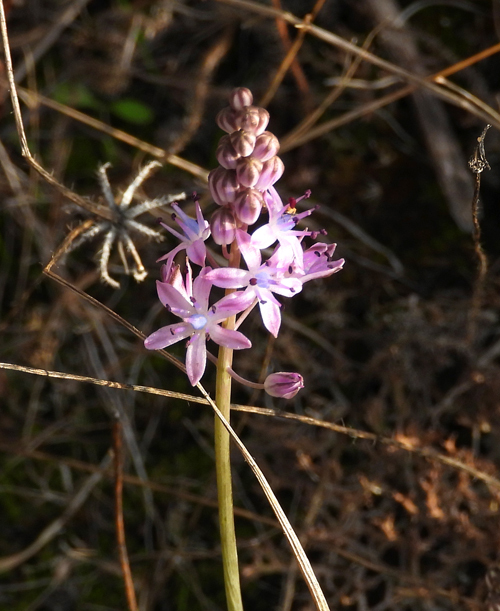 Autumn Squill. 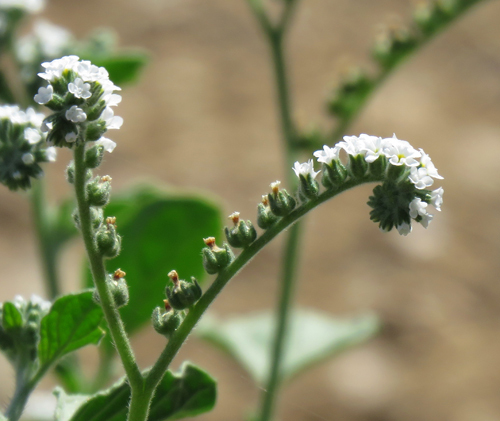 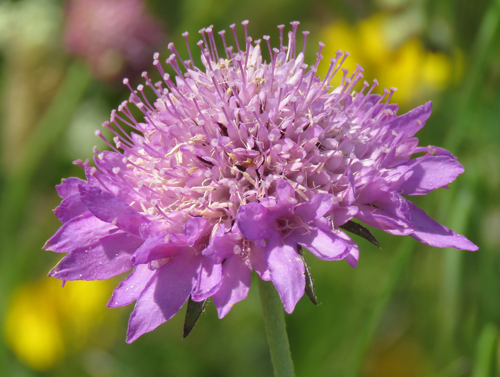 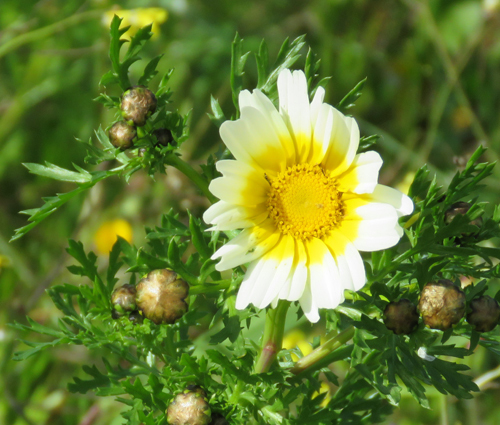 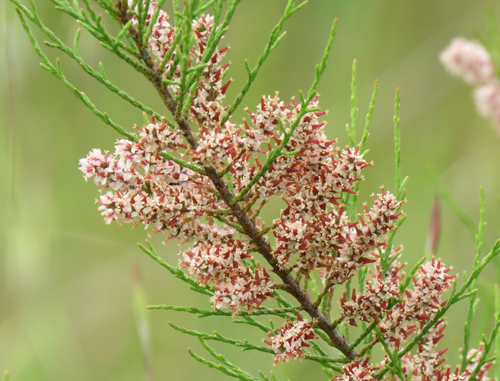 An autumn-flowering species. 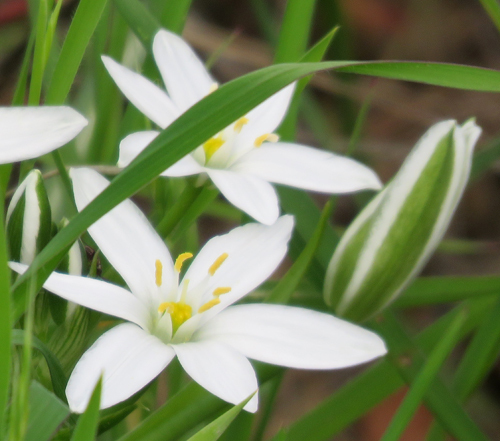 Autumn Snowflake. 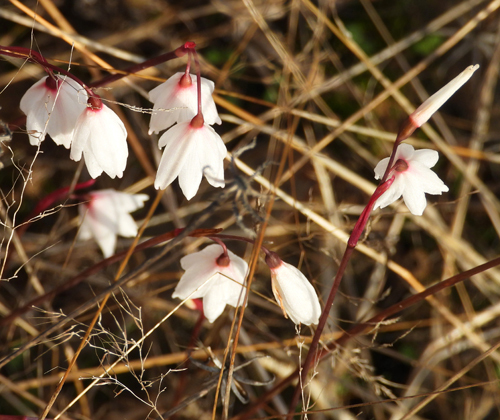 Another autumn-flowering species. 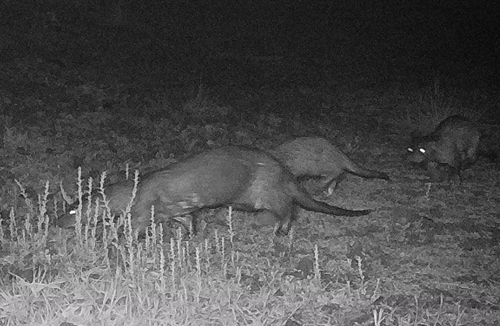 Three Eurasian Otters. 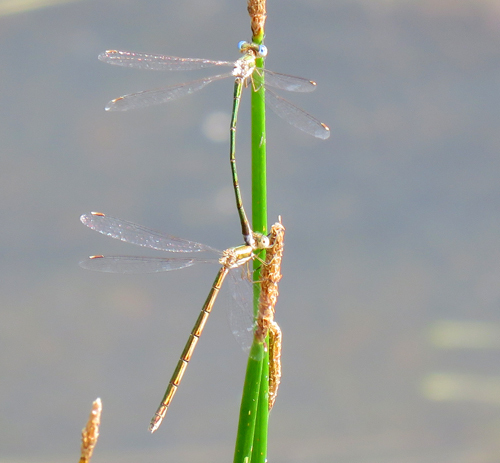 Adult Female with two young ones. 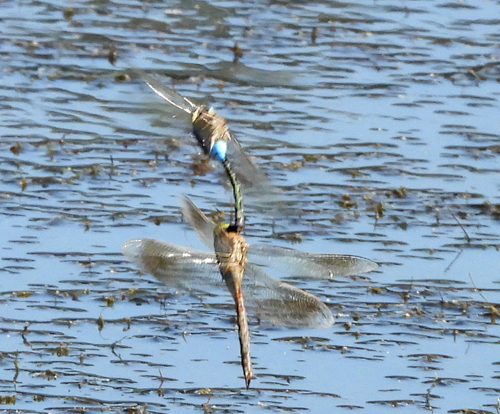 October 2018. 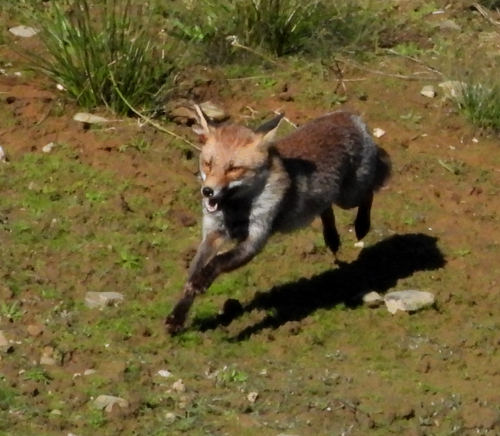 Iberian Fox running along edge of Windmill Pond. 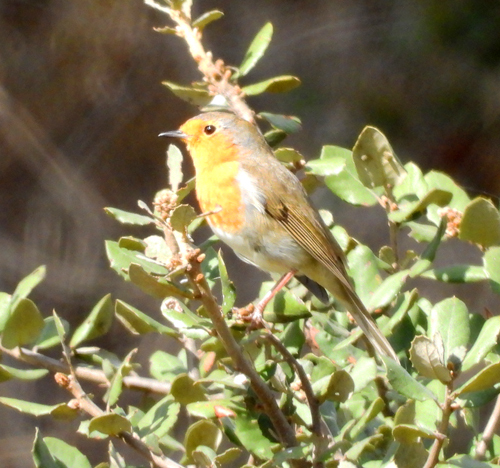 European Robin, a Winter Visitor.